The first thing to be said about Cardoness Castle is a warning!!! If you visit during the early Summer months…..beware the swallows!!! These little blighters will have you in any way they can. The adults will dive bomb you, and the babies, as they’re finding their wings…..will accidentally fly into you….especially dangerous when climbing the narrow staircases. Having said that, the castle is well worth a visit, with much of it still standing and totally accessible. The shop is well stocked with great books on the area and its castles, and the staff were extremely helpful and able to answer any questions I had. The castle can be found at the junction of the A75 and the B796 to Gatehouse of Fleet. The area was obviously of some importance, as there are two mottes in the area. One is about a mile and a half to the East, and the second about a quarter of a mile to the West. The latter is possibly the precursor to Cardoness castle. Another castle, about a mile away, lies to the West high up on the cliff face looking over the road. It’s probable that these fortifications were erected in this area as a means of protecting the inlet, Skyreburn Bay. This waterway would originally have extended right up to the foot of the mound on which Cardoness Castle is built. These days however, the sea is about 200 yards away due to some land reclamation that has taken place. The castle sits high up on a rocky outcrop, some way above the car park. It’s in remarkably good condition when you consider it was probably built sometime in the 1460’s. All that seems to be missing from it these days appears to be the roof and it’s timbers. Otherwise, the stonework is excellently preserved. Walking up the castle, after passing through the shop, there are a number of external buildings, and the footings of other now demolished buildings. These represent a range of porter’s buildings, storage cellars and stables. These buildings were reconstructed in the 1920’s, with this work intending to give the visitor an idea of what the castle’s courtyard would have looked like. The stone ramp leading to the door was built at a much later date….it’s likely that entrance to the tower would have been up a wooden staircase….one that could be easily dismantled in the event of an attack. The doorway is defended in triplicate. The first door would have been a strong wooden door with metal re-enforcement. The second door would have been a yet, and the third defence was the murder hole in the ceiling above the entrance lobby, where defenders could drop or pour things on any attackers who had managed to breach the doors. The ground floor is dedicated to storage. Where now is one room, would once have been divided by a stone cross wall, splitting it into two storage areas. The stone corbels jutting out of the wall would have provided a platform for wooden floor joists, thereby further adding more storage space above. To the rear of the vaulted cellar, small gun ports can still be seen. The staircase leading to the other floors, now all floorless, is narrow and dark, and there are corridors leading off in all directions. There is a tiny prison cell, and beneath a floor grate, another even tinier and probably grimmer, cell. Historic Scotland have inserted a floor into the second storey of the castle, giving you the opportunity to wander around this huge room with its fireplaces and windows still in situ. The wall walk at the top of the castle is accessible, and affords some fantastic views out across Fleet Bay and on towards Wigtown Bay. The motte and bailey castle can even be seen on the grassland to the South West of the castle. 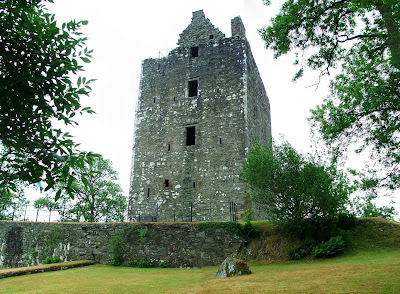 The McCulloch family built Cardoness castle after they acquired lands in the area in the 15th century, although there is a question over which McCulloch actually built the castle…Gilbert, or his son James. 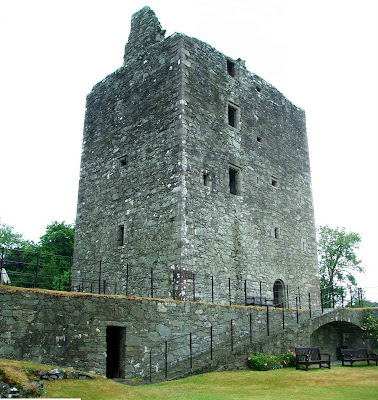 The McCullochs were almost continually in dispute with neighbouring families…..one of which was the Gordon family….who would play a bigger part in the story of Cardoness Castle in the future. The McCulloch family’s constant feuding cost them their fortune, and by the end of the 1590’s, they were seriously in debt. In 1628, John Gordon bailed the McCullochs out of debt, when the castle was mortgaged to the Gordons. 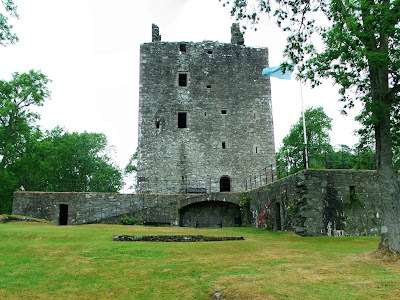 However….the change of ownership seems to have passed the McCullochs by, and some 35 years later, they were back ensconced in Cardoness castle again. The Gordon family used Bush ‘o Bield, an ancient family home, as their base, and may not even have moved into the castle. The McCullochs and the Gordons continued to fight amongst themselves, with the castle more often than not, the centre of these arguments. 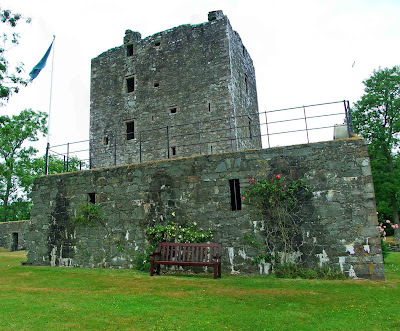 Godfrey McCulloch was executed for his misdeeds against the Gordons, including a number of murders….and with the demise of Godfrey, the McCulloch family seemed to have abandoned the castle. The Gordons didn’t move back in either, and the castle began to fall into a serious state of disrepair. Lady Maxwell placed the castle in state care in 1927, and it seems that things have only got better since then. Below. Some old prints and cards, including a floor plan of the tower.